Researchers from Carnegie Mellon University’s College of Engineering have found that an increased adoption of electric vehicles (EVs) would result in reduced consumption of gasoline and consequently a decrease in gasoline tax revenue that currently supports infrastructure development and maintenance in the U.S. The scientists say the loss of tax revenue could be between $200 million and $900 million by 2025, depending on the EV adoption rate. In a recent paper, the team proposes several solutions to this pressing issue, which is exacerbated by the fact that current annual infrastructure expenses exceed revenue. The proposals include a flat vehicle registration fee, a tax of 2 cents per mile, or a tax on electricity while charging EVs. “Since a relatively large portion of fees are collected through vehicle use by way of taxes on gasoline (about 50 to 70 percent), large-scale adoption of EVs would result in a decline in revenue generation since they use little to no gasoline as fuel,” said Alan Jenn, a Ph.D. student in the Department of Engineering and Public Policy (EPP), and lead author of the paper. The team also includes EPP Associate Professor Inês Lima Azevedo and Paul Fischbeck, professor of EPP and social and decision sciences. The team, whose findings were published in Transportation Research Part A: Policy and Practice, studied gasoline generation in traditional vehicles versus EVs. Jenn, Azevedo and Fischbeck’s three solutions will offset the decrease in gasoline tax revenue. One solution is to include a flat annual registration fee at 0.6 percent of the vehicle’s manufacturer suggested retail price, while a second is to charge a 2 cents per mile fee. Their third solution is to tax the electricity used to charge EVs by 4.5 cents per kilowatt-hour. The team, however, notes there are challenges to these proposed solutions. Despite the above challenges, the group emphasizes that this issue is an important one. “Decreasing revenue generation from EVs represents a small but growing problem that should be considered in future strategies to increase revenue for transportation infrastructure funding,” Azevedo said. 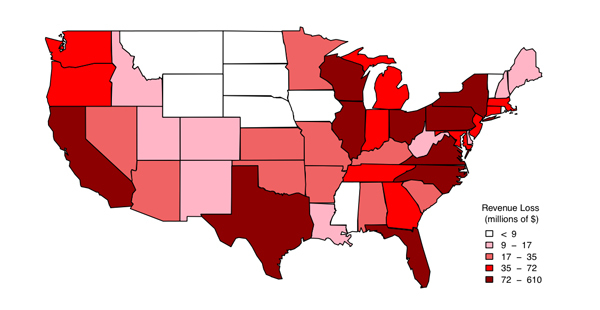 The above map shows the expected tax revenue loss by state through 2025, due to the reduction in gasoline consumption caused by electric vehicle sales.